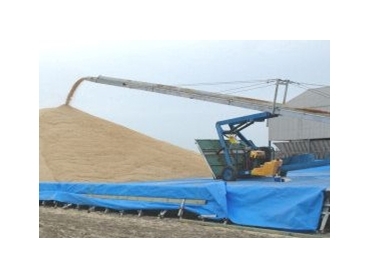 Grainmaster Bulk Storage Systems offers a complete service. They provide the design of the grain storage bunkers, assistance with earthworks if necessary, supply of tarps, supply of augers and belt drive conveyors. They can also organise freight and erection of their grain storage systems on site. In fact, they can organise the entire on farm or commercial grain/bulk commodity bunker storage systems. These are not limited to grain storage. They can even handle hazardous materials. They currently have bunkers in mine sites and feedlots all over Australia. Grainmaster employs a team of experts with more than 25 years experience in the design and fabrication of agricultural sheds and bunkers. They are able to take the guess-work out of grain storage and to deliver excellent profits from the harvest.